Global Navigation Satellite System (GNSS) Continuously Operating Reference Station (CORS) networks are being introduced across many countries to provide improved access to positioning infrastructure for a wide range of applications and a solid platform for research and innovation involving satellite positioning technology. 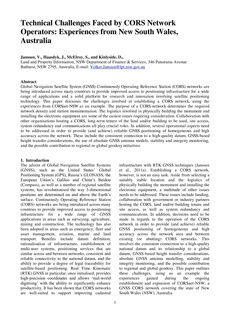 This paper discusses the challenges involved in establishing a CORS network, using the experiences from CORSnet-NSW as an example. The purpose of a CORS network determines the required network density and station monumentation. The logistics involved in physically building the monument and installing the electronic equipment are some of the easiest issues requiring consideration. Collaboration with other organisations hosting a CORS, long-term tenure of the land and/or building to be used, site access, system redundancy and communications all play crucial roles. In addition, several operational aspects need to be addressed in order to provide (and achieve) reliable GNSS positioning of homogeneous and high accuracy across the network. These include the consistent connection to a high-quality datum, GNSS-based height transfer considerations, the use of absolute GNSS antenna models, stability and integrity monitoring, and the possible contribution to regional or global geodesy initiatives.